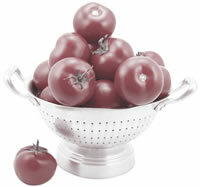 New evidence shows lycopene is not just a cancer fighter. Here's another reason to savor tomatoes: a recent study in Neurology finds they may help lower your risk of ischemic stroke—blockage of a brain artery that starves cells of oxygen and causes them to die. "We don't understand it entirely yet, but the lycopene in tomatoes may have specific properties that protect the cell in a way other antioxidants may not," says Dr. Edward Giovannucci, a professor of nutrition and epidemiology at the Harvard School of Public Health.